In 2017 Malaysia retired entire fleet of MiG-29 (probably 10 flyable and 6 grounded aircraft which requires repairs). Russian offer to upgrade were ejected. Local code name is M43. 19th Squadron (Skuadron), Kuantan (Sultan Ahmed Shah). Emblem is a cobra. 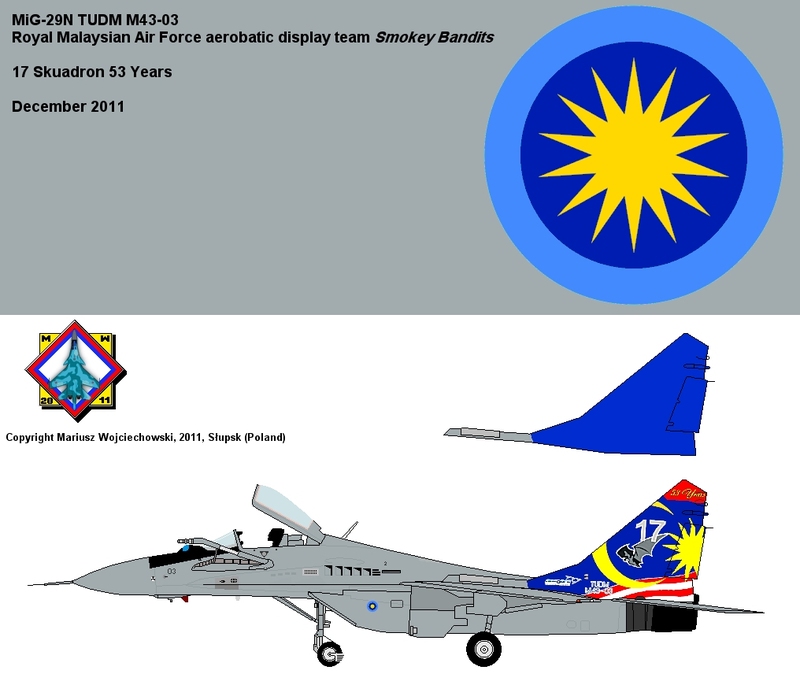 Since 2007 17th Squadron (Skuadron), Kuantan (Sultan Ahmed Shah). Emblem is a bat. 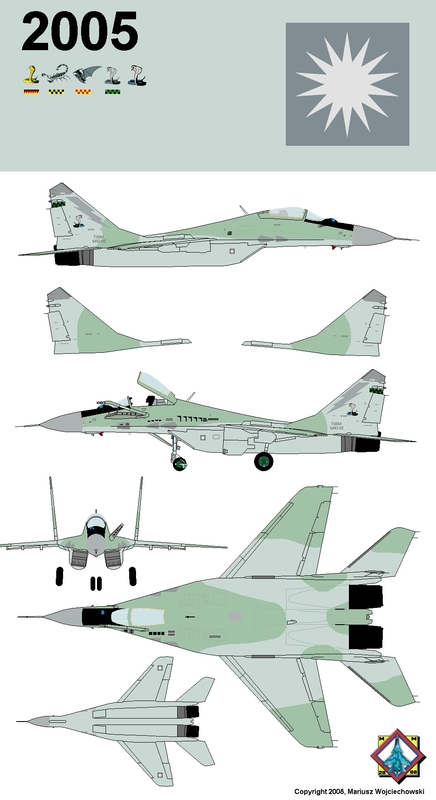 Malaysian MiGs were in standard grey-green camouflage with low-visibility markings, about 2005-2006 they are overhauled and repainted in overall grey with colourful markings. MiG-29N (M43) no. 05, Malaysia 1995. 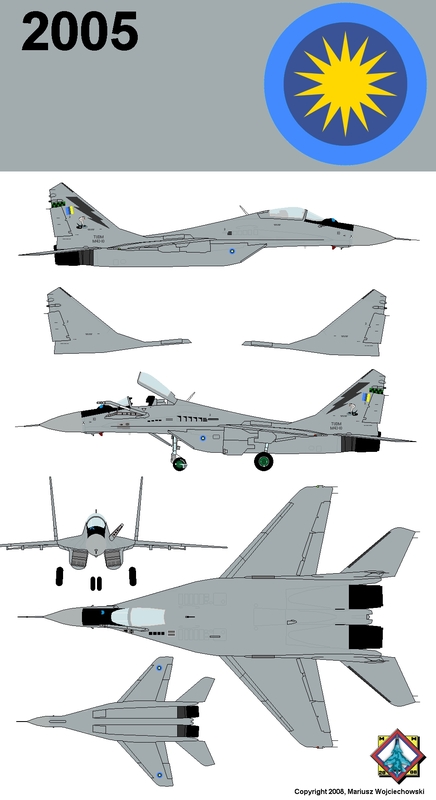 MiG-29N (M43) no. 05, Malaysia 2005. MiG-29N (M43) no. 10, Malaysia 2005. MiG-29N (M43) no. 18, Malaysia 2007. MiG-29N (M43) no. 03, Malaysia, December 2011. Occasional painting: 53rd anniversary of the 17th Squadron. It's a aircraft from TUDM aerobatic display team "Taufan Ganas" [Smokey Bandits], formed by both 17th and 19th Squadrons.